Black History month celebrates many inspiring people from many different time periods and backgrounds. And what better way to commemorate it than to read books about these inspiring people! Our family loves the Who Was ® series of books and I have posted before about some of the books we have enjoyed. (Click here for our other lists: Inventors, Women’s History, US Presidents.) They are great biographies with lots of interesting facts presented in an engaging narrative. Plus, they include lots of drawings. Here, I organized a list of all of their books to date that would be appropriate for black history month or to read throughout the year. There are also two books in their What Was… series that are perfect for this study. In total, there are 25 books! At the bottom, there are FREE printable bookmarks you can download to take notes on while reading any of the Who Was… books. An escaped slave who advocated against slavery and for women’s rights. An escaped slave who became the father of the Civil Rights Movement. Another escaped slave who helped many others escape. She led a very interesting life, including spying for the Union Army! She is also featured in our Women’s History Notebooking Pages. This would be great to read along with Who Was…Harriet Tubman? and gives an in-depth look at how slaves escaped to the North in the 1800s. A former slave who founded the Tusksegee Institute to provide a formal education to black people. A former slave who became a professor and botanist, developing new ways to grow crops. This would make a great addition to a unit study on botany. A great jazz musician who had a troubled childhood. You could include this book in a study of the history of music. An Olympic medalist for track and field that pushed through racial barriers at a worldwide level. The “Mother of the Civil Rights Movement” who did much more than refuse to give up her bus seat. The first black president of South Africa who lived a long and interesting life. The first black major baseball league player. Read about what he faced in this role and how he responded. Not only was she Martin Luther King, Jr.s’ wife, but she was a Civil Rights leader herself as well. A wonderful poet and author. After finishing this book, you could read some of her works! Bonus: Listen to her read one of her works or give a speech or interview as she had an amazing voice. A great book to read with Who Was Martin Luther King, Jr.? It covers the reason for the march, how it unfolded and the influential people involved. Black and white photos are included. A group of African-American military pilots that fought in World War II. This book would be great as part of a study of World War II. A world class boxer known as “The Greatest” and a political activist. A great musical artist and the first woman inducted into the Rock and Roll Hall of Fame. A Jamaican reggae musician who influenced the world. A singer-songwriter who started his professional career as a child. Great alone or as part of a study of music. Another amazing entertainer who started his career as a child! Our 44th president. This book was published during his first year in office and therefore focuses on his life leading up to that year. Our former first lady. This book covers her life from childhood through her first term in the White House. These sisters are world famous tennis stars. These FREE printable bookmarks can be used to take notes while reading any of the Who Was…books in this list to learn about black history. 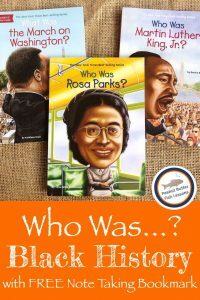 Subscribe to receive the Who Was in Black History Bookmarks and our latest posts and freebies straight to your inbox. This is really a great resource and I am happy to see a nice *list* of notable Black Americans throughout history in the USA. I would, however, like to ask that if you are going to take the time to teach Black history that you include so many other notable Black Americans and not just the same cookie-cutter versions of who these people are. Black history is American history and it deserves more than a handful of people being recognized (even though they weren’t in their time). I totally agree with you Tonya! Thank you for pointing this out! Since this was a listing of books in a particular series I was limited to who they have written about. I have included many other notable people who are black in our Inventor Person of the Day Cards and Women’s History Person of the Day Cards. Creating a set of Black History Person of the Day cards is in the works as well.